~~As an artist and a Mom, I love to find ways to encourage creativity in my kids. I love to come up with ideas or find products that encourage them to use their imaginations. Albert Einstein once said, "Imagination is more important than knowledge. For knowledge is limited to all we now know and understand, while imagination embraces the entire world, and all there ever will be to know and understand. "I'm thankful that my girls are already showing that they have big imaginations and want to continue to nurture them. ~~So I thought I would try to make it a point to share ideas, products, games, etc. when I come across them. I would love for you all to share your ideas with me too. 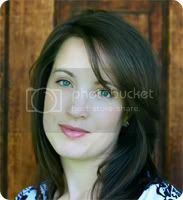 Just email me at happymommykasie (at) yahoo (dot) com, or leave me a comment. 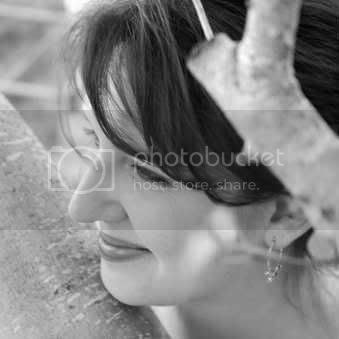 ***I would like to mention my friend Elise. Once a week she shares Toddler Triumphs; neat and fun ideas that she has tried with her sweet little girl. Elise is such a creative Mom and I love all of her ideas. One of my favorites was the Ziplock Bag Animals. ~~I have to admit that I have a love-hate relationship with Playdough. Playdough is awesome and the girls will play forever making cupcakes or cookies, building outdoor scenes for their little plastic animals, etc. But here comes the hate part; Playdough is messy! No matter how hard you try to keep it contained the stuff somehow finds its way all over the house. I laughed at our Easter picture this year when I noticed playdough on the bottom of Savannah's shoe. Playdough is wonderful when it's fresh but it dries out rather quickly and then becomes a crumbly, crumbly mess. All I can say is thank Heaven for my Dyson! 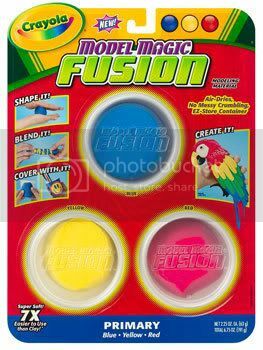 ~~So when my Mother-in-law pulled out a package of Crayola Model Magic Fusion for the girls to play with, I thought it was just another fancy-shmancy playdough. Wow! I was wrong! This stuff is really, really cool. It's very soft, squishy and moldable. We have a big bag of plastic cookie cutters and they work very well with the model magic. And the most exciting thing; this stuff doesn't crumble. Any. Clean up was one hundred times easier. I didn't even need to get out the vacuum. Needless to say I was hooked and bought a package for our house. The Crayola website says that it will stay fresh in its package (so far no problems) but can also be shaped into forms that will harden without cracking. We haven't tried that yet. So all in all I would have to give this stuff a big thumbs up. Lots of imaginative fun for kids and a little less mess for Mom! I agree with you. Imagination and creatvity is so important. Thank you so much Kasie for your compliments. I was thrilled when I saw that I got a special mention on your blog. What an honour which I really appreciate. You certainly have given this model magic fusion a great wrap. I am going to see if I can get my hands on some of this over the weekend, it sounds awesome. PS Is Savannah still vomiting once a day, or has the treatment you've been trying stopped this completely? wow, i bet my kids will love it! i'd heard it mentioned but now i have a "true" testimonail. Thanks for the ideas! Have to check out that model magic. Sounds great! I can't wait to try this stuff! Thanks for sharing! Model Magic is a little magic. My older son used it to coat a styrofoam ball and made a really cool looking model of a cell. He was able to stick all kinds of do-dads to it and in it, for a neat effect. My younger daughter loves to just squish it and make stuff with it. I'm glad they have air-tight containers now, because it does dry kinda quickly otherwise. We love art around here, too ... even though I am far from being an artist. Hope that I can raise two, though. Great links. Thanks!